Congratulations to Ray Webber, the winner of our 2017 Christmas Trailer Raffle which was drawn on Christmas Eve. Ray was at the draw, which was held at the Golden Fleece and happily accepted the trailer and all it's contents on the night. 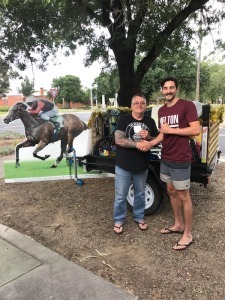 Photo: Ray Webber presented with the trailer by Bloods footballer Malcolm Beck outside the Golden Fleece.